I've been back to school for Sept, working at Wendell Elementary, a science and art magnet A+ school. This residency was another multiple grade science integration adventure. This is the 3x5' mosaic assembled by 3rd grade, "Lifecycle of a Seed". We learned about how a seed grows in the soil (humus, clay, and sand), needing water and sunshine, develops a root to absorb minerals in the soil, and shoot that pushes out of the ground, and then a flower or fruit develops with seeds, to start the process all over again. This is the 4th grade panel, showing different types of fossils to align with their rocks and minerals curriculum. We learned about how fossils are formed; trace fossils (dino footprints), casts/molds (trilobytes and ammonites), carbonization (fern and ginkgo leaves), and permineralization (megalodon teeth, petrified wood, mammoth bones). This 5th grade panel depicts the three main ecosystems in NC; mountains, piedmont, and coastal. We learned about how features in an ecosystem work together, and identified landforms, animals, and plants specific to each region. The mountain region shows a mountain and waterfall, trees (there are over 100 different species, which is more than all of Europe), monarch butterflies, and salamanders (another strange fact, more diverse species of salamanders in NC than all of the world). The Piedmont region has rivers and rolling hills, with dogwoods (state flower), oaks, grassy meadows, and our state fish. The Coastal region shows sandy dunes, venus flytrap and insects, the ocean, Scotch Bonnet (state shell), and shore birds. 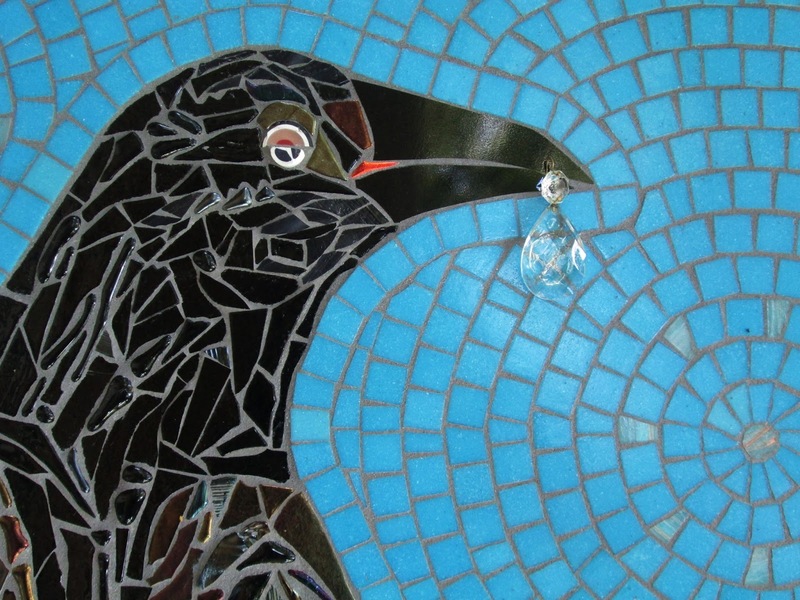 This mosaic is inspired by the story out of the UK recently about a young girl who likes to feed the crows in her backyard, and they began to bring her shiny treasures. They are extremely smart birds, and this is a documented behavior, usually collecting their finds in their nests or gifts to mates. 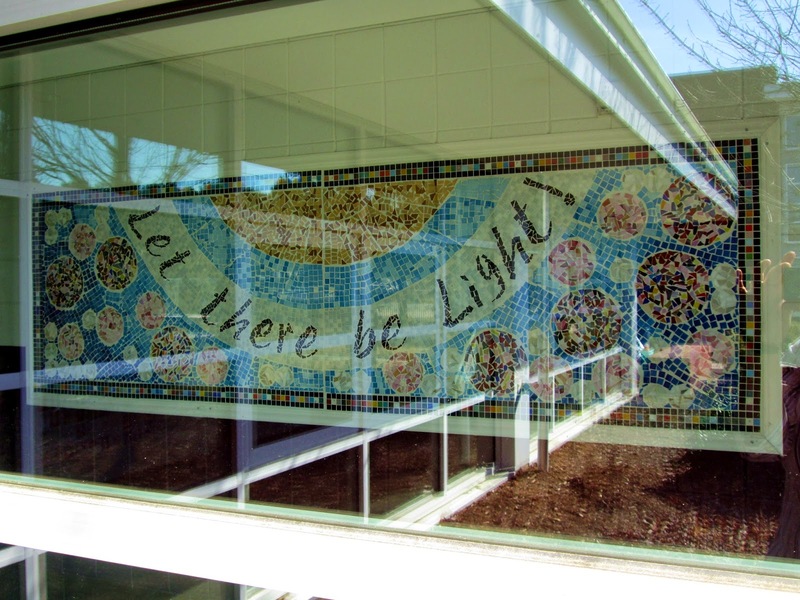 The work is approx 32 in H x 24 in W, iridescent and dichroic stained glass fusions, vitreous glass tile, unglazed porcelain tile, large milifiore, found objects, chandelier pendant. 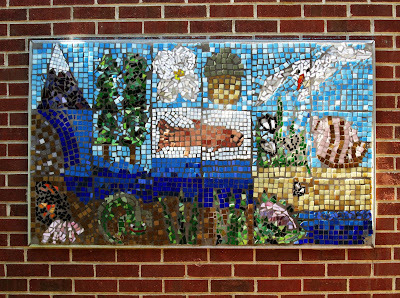 Club Boulevard Elementary, Durham NC, 5th grade legacy mosaic project 3x5', exterior, humanities focus. 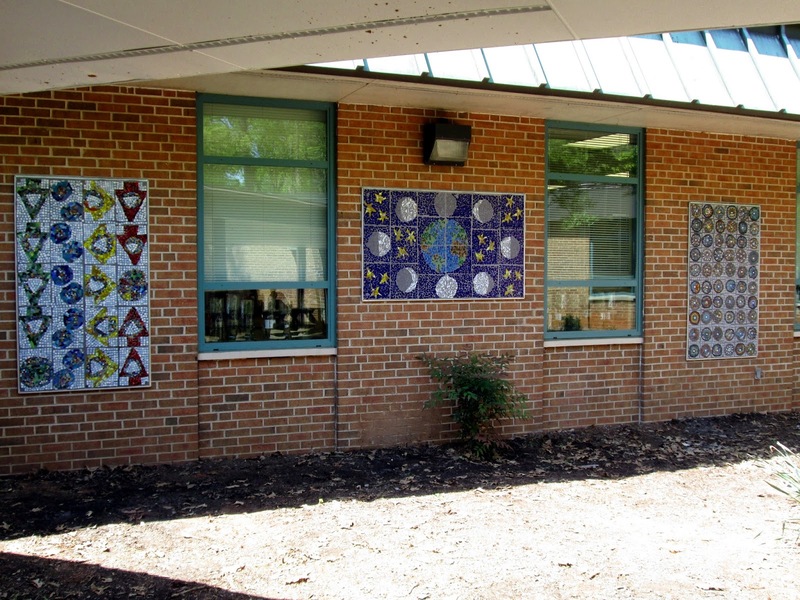 Hillandale Elementary, Durham NC, 3rd grade mosaic and math (pattern, area, rotation), hurricane mascot. ONE MORE TO GO for the school year 2014-15! Here is my finished "Studio Assistant". 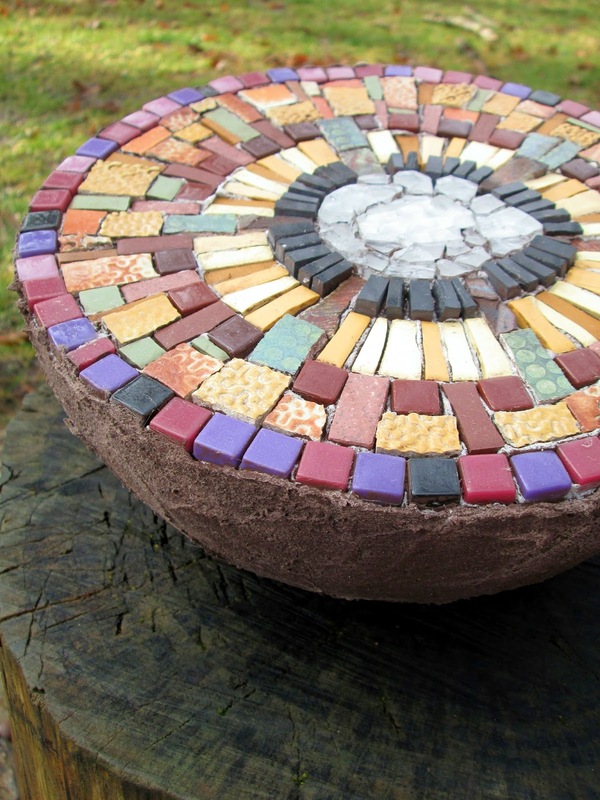 I am pleased with the light minty green background and the andamento or flow of the pieces is just right to enhance the roundness of the "dung" ball of mosaic scraps. I also exchanged a couple of pieces in the beetle leg shadow to elongate the line. These two pieces were already glued, and I 'almost never' pry up pieces that are glued, but it was bugging me (pun intended). Unlike painters, who can constantly rework their art by applying more paint, working with hard materials is quite different, and once a piece is down... it usually stays down. I normally respect this aspect of mosaic, but occasionally a couple of changes can make a big difference. 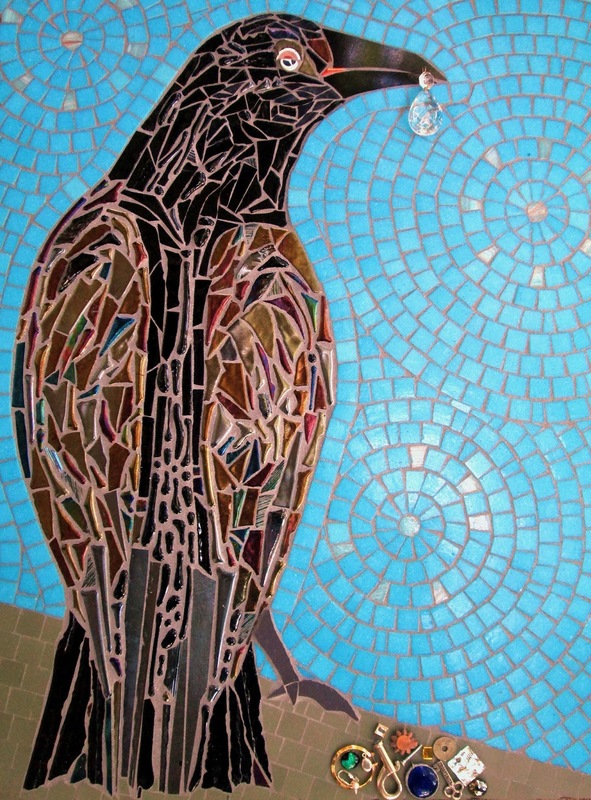 Additionally, the light tan grout complements this mosaic perfectly. 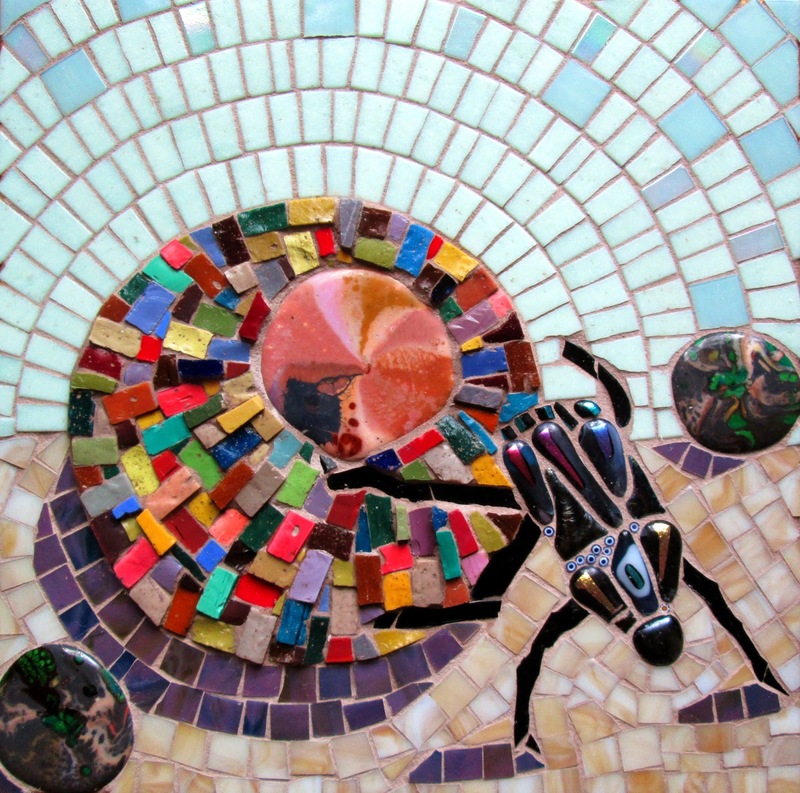 It neutralizes the background, and lets the color and texture of the ball, as well as the beetle take center stage. 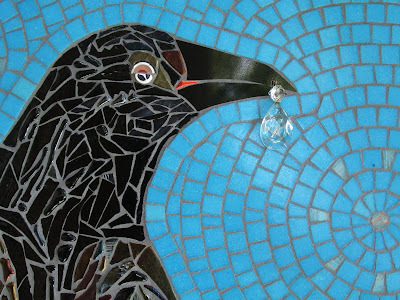 About six months ago, on a routine stop into Carolina Stained Glass, I found out that Martin Cheek, mosaic master from the UK would be teaching a weekend workshop right here in Durham! I had seriously considered going to his workshop in England (sorry, Italy won out), and then again a couple of years ago saw he would be in Orlando, FL, but alas, not a good travel weekend for me. So I was elated to have the opportunity so close to home (literally 4 miles) to meet him and spend a weekend on personal mosaic making rather than school residencies. He is known for his whimsical and humourous animal characters, and technically sound work of over 30 years. 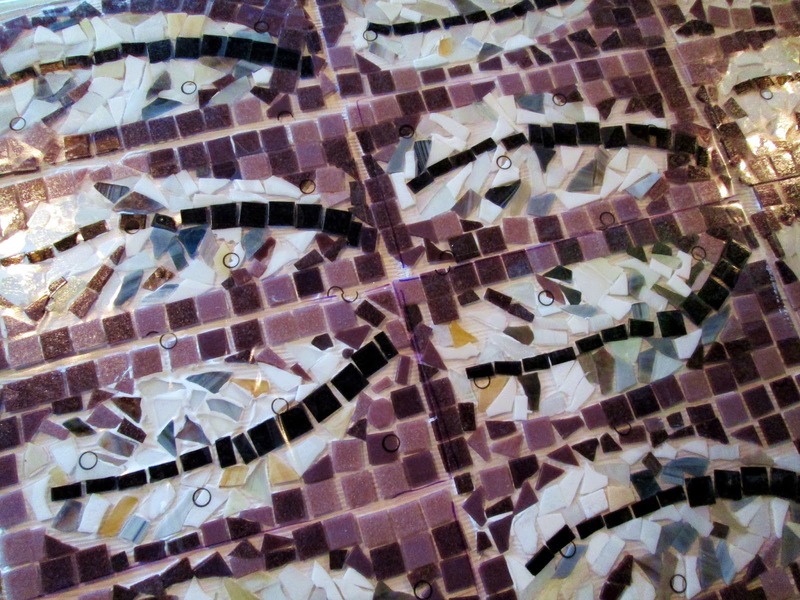 In fact, one of his 7 books was the first I ever bought and inspired me to make mosaics. 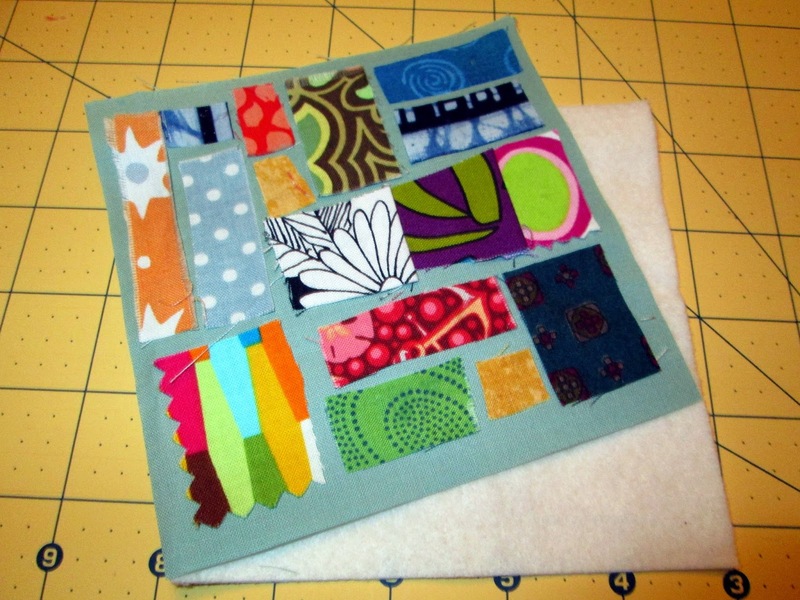 I prepared a couple of potential designs for this "Incorporating Fusions" workshop, not knowing what fusions would be available... I had a jellyfish, crow, abstract plant form, and a dung beetle design at the ready. There were many beautiful and colorful fusions to choose from, but some of the black and dichroic fusions jumped into my hand and onto my cartoon. Black stained glass with the natural, wiggly, rolled edge was perfect for the legs. I did try some smalti for the first body section, but I wasn't pleased with it. The other new thing I gleaned from his presentations is the use of shadow. I like the effect, but realize now that the shadow for the beetle legs is too wide. I should have just used narrow pieces for the skinny leg shadows. I would have selected a lighter grey, but this purple was the best available choice at the time. I was able to complete the desert/studio floor, but wanted to access some vitreous glass tile I have at home for the top. 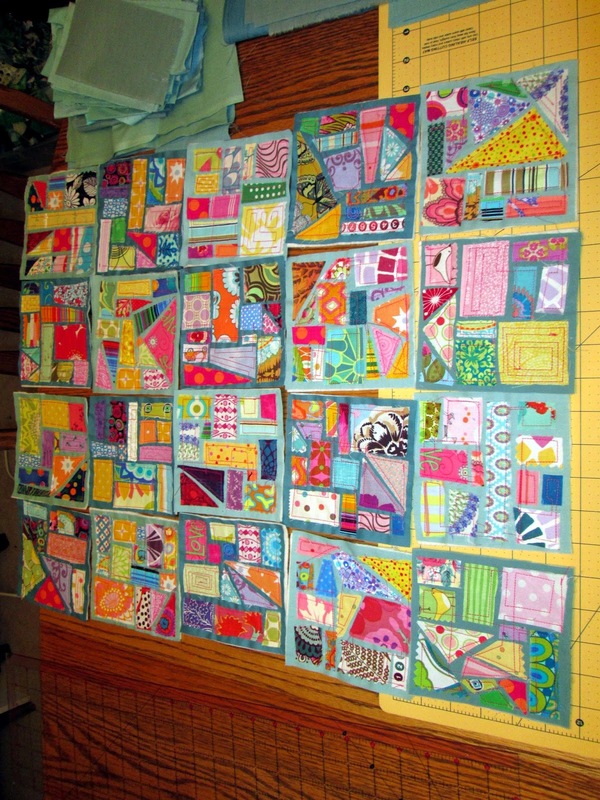 I should have some time at the end of this week or next to finish it up. I do like the option of creating and using the glass fusions, although I would prefer to use them sparingly. Some of the participants were mainly using the fusions, which then resulted in mosaics very similar to Martin's. Clearly that is what the workshop focus was about, and good for his business (some fusions were included, then extra cost per weight of fusions), I like the greater mix of materials (smalti, stained glass, milifiore, and will add vitreous glass), and feel that my own style would be best served with just a few of the fused pieces. 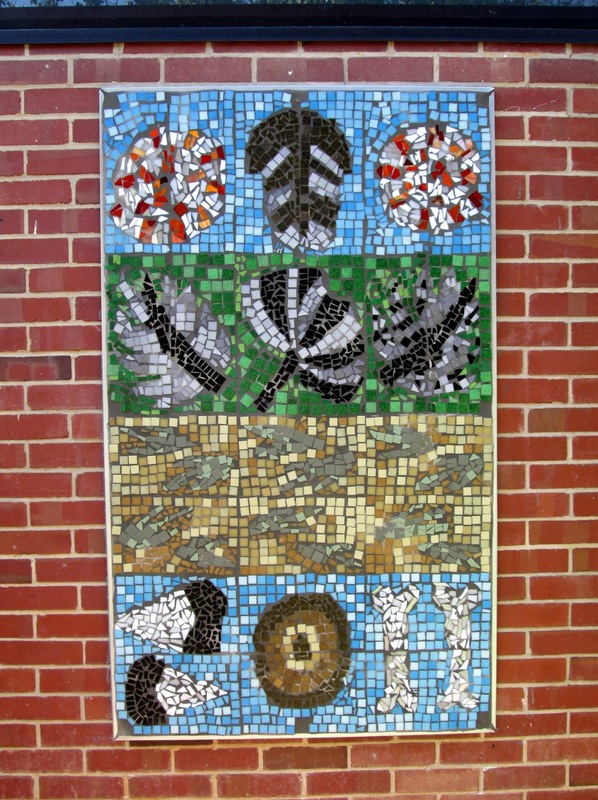 5th grade legacy mosaic project : 6 panels of (hawk) feathers with various color family backgrounds. 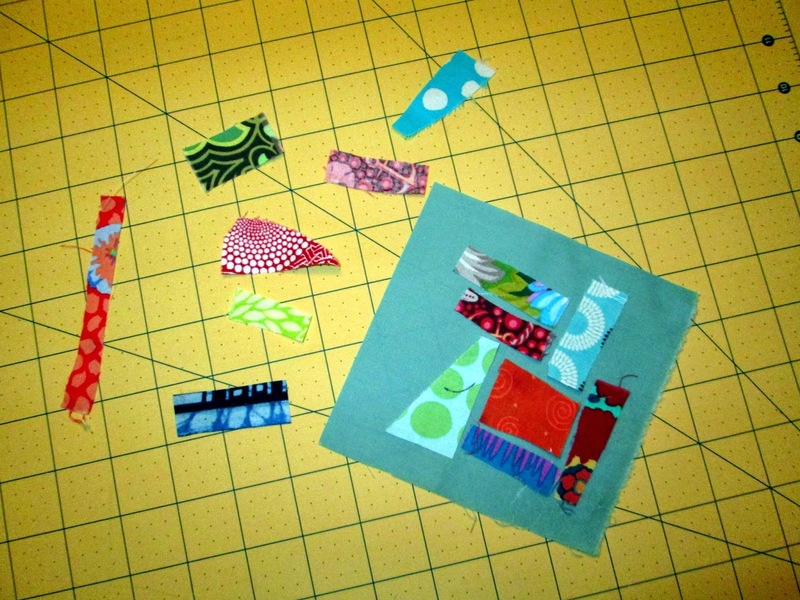 Many of these students found piecing the shapes more difficult than they thought it would be. Working with a partner helped make it extra fun. Last class of the day had the purple background pieces. This week I am working at Glenwood Elementary in Chapel Hill with 4th grade. This residency is sponsored by the Town of Chapel Hill, and I was selected out of several applicants to create a project based on immigration of different cultures into NC. 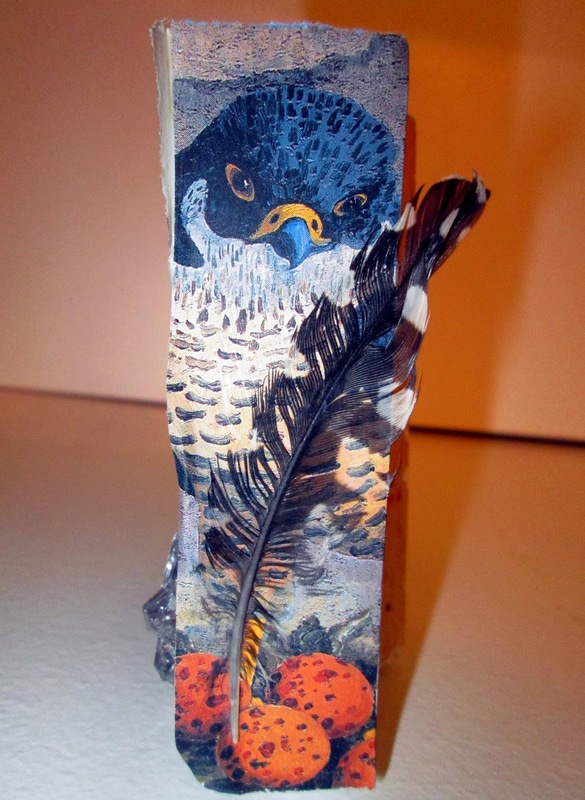 Using migrating birds as symbols for this main idea, students are designing their own bird with colors and symbols that connect with their family history or a historical group that settled in North Carolina. We talked about why people immigrate from one area to another, as well as the things that make up culture and how it can be represented by colors and symbols. This is a wonderfully diverse school and the students have made some fantastic design choices. First they planned it out on paper. 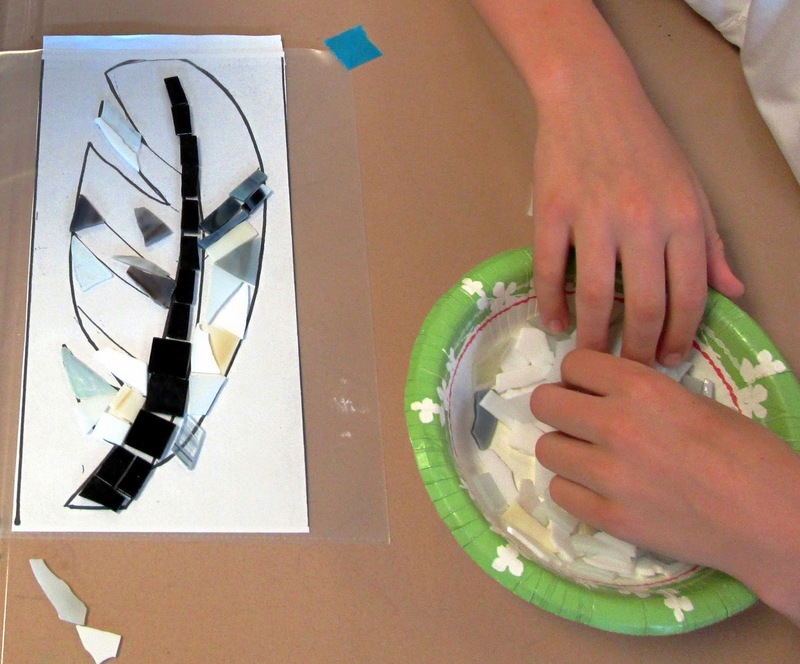 Today they began to choose and lay out their selected pieces (precut and tumbled stained glass) and then could start to glue each piece. A few students finished, but the majority will finish up tomorrow. I will grout them, and they will be installed hanging in V formation in their hallway between the cafeteria and exterior bank of windows. This hallway has windows on both sides, plenty of natural light, 15 ft ceilings, and every student travels that hall every day. It is truly a gift to me to be able to do this work that I love. One of the school residencies that I have this year is at Douglas Magnet Elementary in Raleigh. 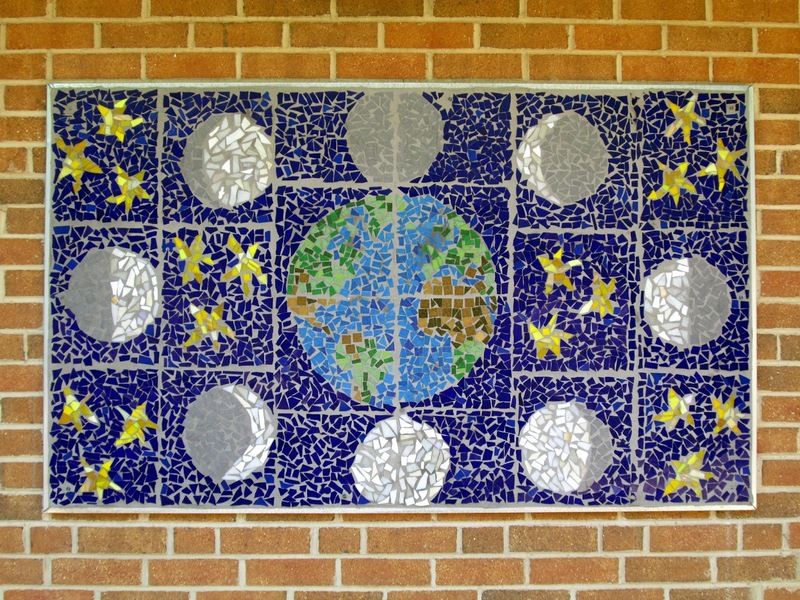 The coordinator there contacted me last year and we designed/wrote a grant for 3rd, 4th, and 5th grades to work with me to create 3 3x5' mosaic panels, each integrating a specific theme targeting their science curriculum. I don't know if I have mentioned in the blog before, but I am not an art school artist, I have a biology/sociology degree from UNC. I didn't even take one art class there (boo). When I was a kid, I loved making things, but wasn't too great at drawing and painting (therefore, no one ever suggested I should be an "artist"). It has been a treat to marry science themes with mosaic for this residency, and this past week was super busy and super fun with hundreds of students! Third grade is learning about phases of the moon. I definitely had to refresh myself on this theme. We did a worksheet together, then they chose one phase to render in paper mosaic. Their collaborative glass mosaic was also completed this week (and I will post later). In the 4th grade classrooms, they are studying rocks and minerals, so I suggested we base our project around geodes. Plain and crusty on the outside, beautiful minerals and crystals on the inside... We talked about how geodes are formed, and assigned colors to the different minerals that can be found inside. They had creative choice to design their own geode and render in paper to prepare for the glass mosaic we will complete in a few weeks. 5th graders had a different challenge. We looked at several examples of abstract and geometric art and looked for ways they could show the concepts of force, motion, gravity, friction, and inertia. Then, they were to do come up with their own depictions of one of those definitions using only basic geometric shapes like circles, triangles, squares, arrows. I wasn't sure how this would work, but they did GREAT, very creative in their conceptual thinking about science and art! 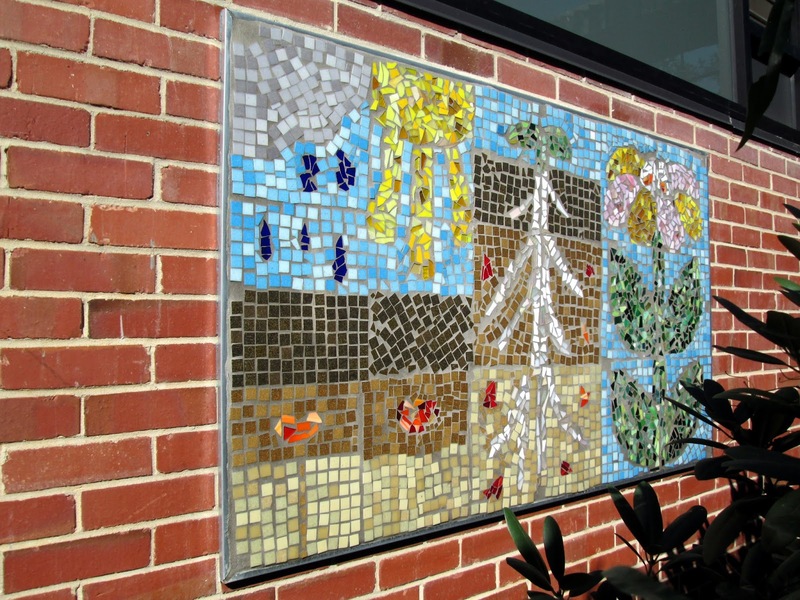 Their glass mosaic will also be done in April. Thanks Douglas for a fantastic week! After two weeks of disrupted school residencies and winter weather, this week finds me scrambling to reschedule, reorganize, and refocus. I learned a while ago not to book my calendar completely full, but leave a little wiggle room for unforseen events. My oldest son is home this week from college for break, so I had originally planned it as my Jan/Feb wiggle room week (not that he was wanting to spend everyday with me). 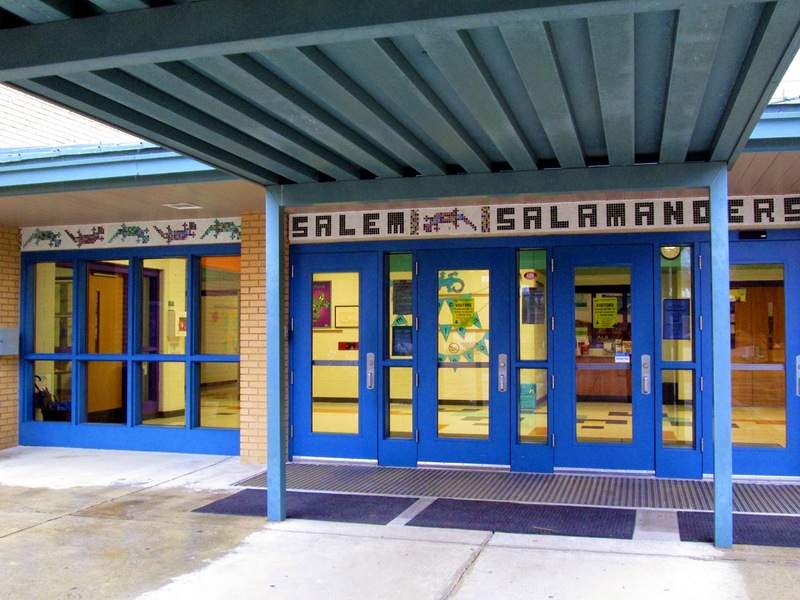 Now, I'll be at a rescheduled Elementary school most of the week, and next week will be essentially doubled up at another Elementary that I have a longer term project in progress. The good news, of course, is that I can still fulfill these contracts, and the coordinators have been extremely helpful with making the time work despite their constraints and loss of traditional instructional time. 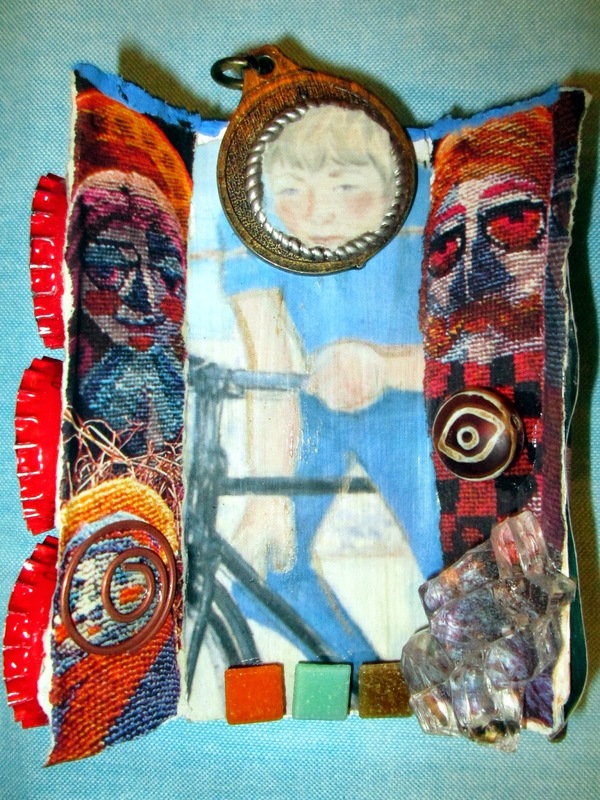 For this post, I wanted to touch on the importance of the introduction session of my mosaic residencies. 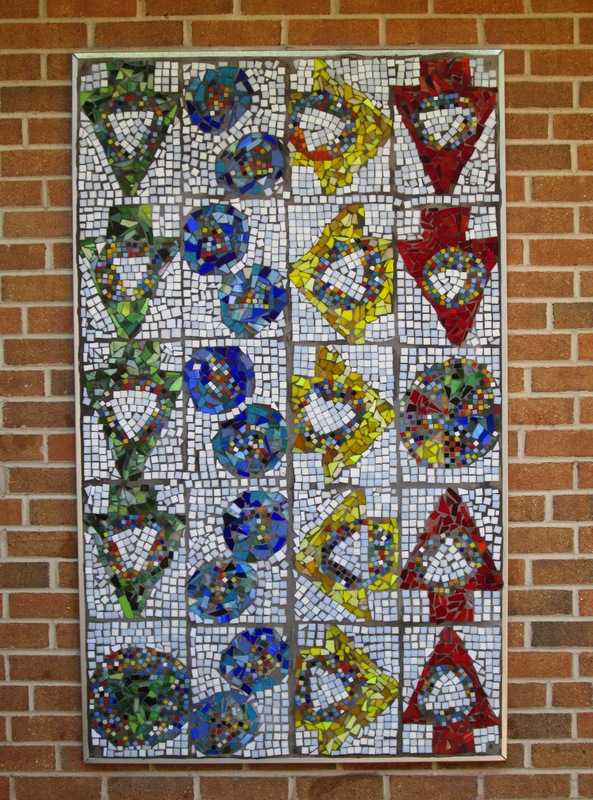 Generally when I go to a school, only half or less of the students have ever heard of mosaic art. 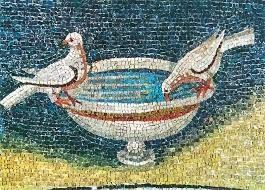 I spend about an hour with a powerpoint presentation that shows them about 15 examples of mosaics from ancient times to modern examples. This is a very interactive presentation with historical stories about the art, multicultural references, pattern vs. picture, all tailored towards the age of participant. By the end of the session, they have a broad understanding of what mosaic art is and can be. Without this information, the making activity is just another arts and crafts project. My presentation includes history, cultures/social studies, language arts (new vocabulary), math (shapes, measurement), and science (properties of materials). You can't get any more curriculum integrated than that. I invite anyone who does not see the value of arts in elementary arts education to come to my residency sessions... you might learn something! All the workshop, pricing, lodging, food, etc info and booking at www.folkschool.org. 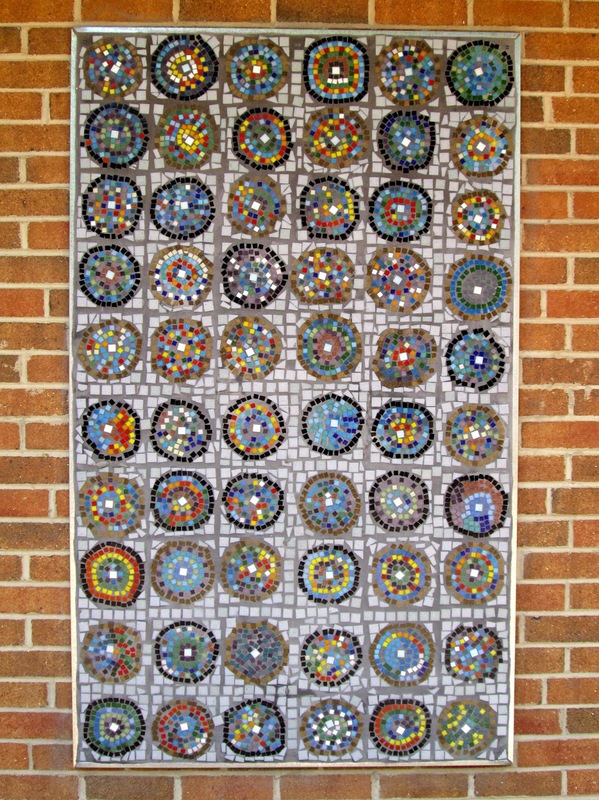 10'x3' mosaic mural residency with 425 students K-8th grade over the course of one week (plus grout day). 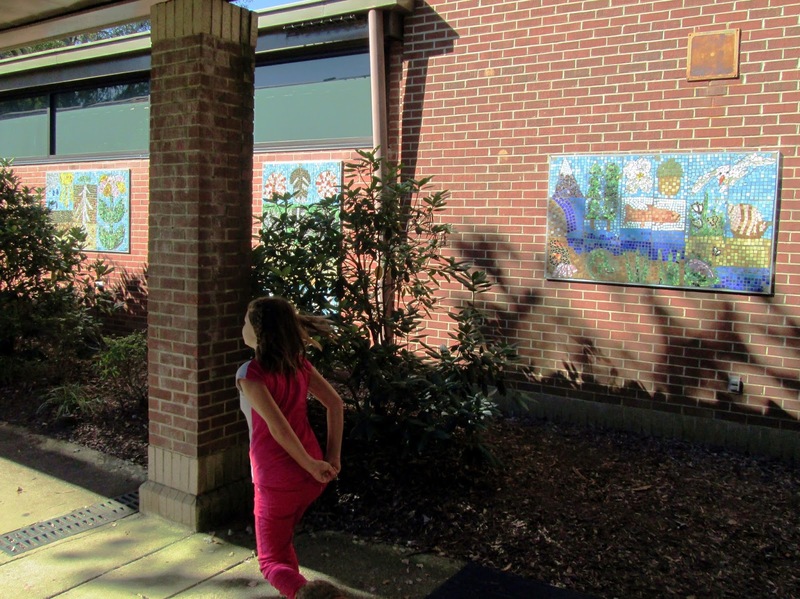 Thank you to Ms. Oglesby and faculty of St. Mary Magdalene Catholic School in Apex, NC for a great project! 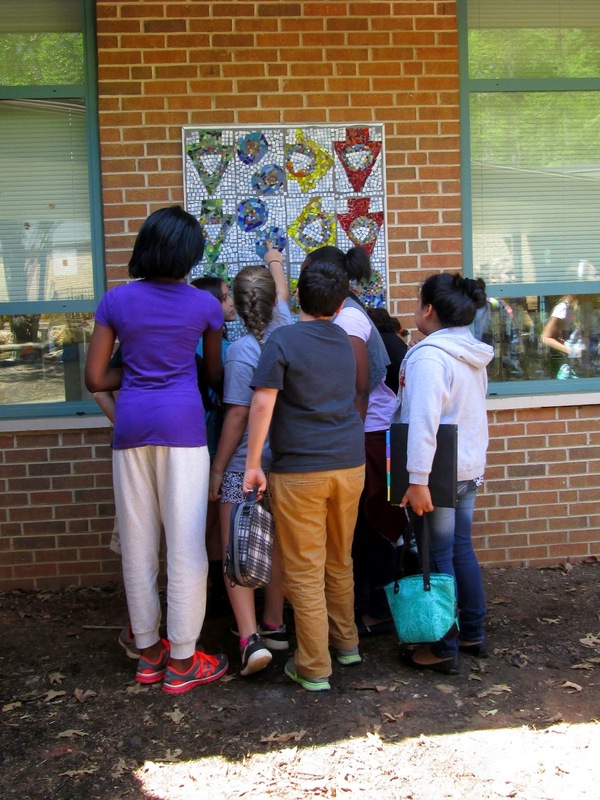 Last Fall I was pleased to work with the 5th grade class at Salem Elementary School on a mosaic mini-mural for their legacy gift to the school. 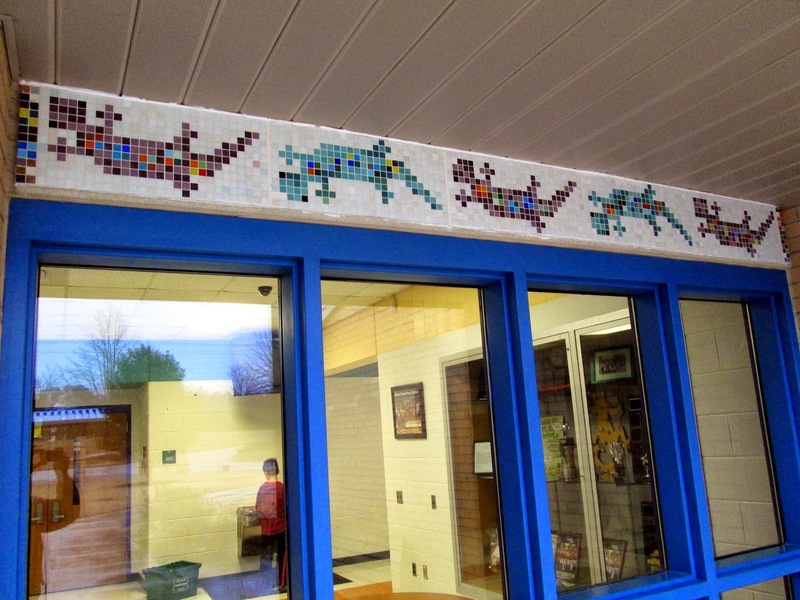 I was really happy to be asked back to work with this 2014-15 5th grade class for an even more prominent mosaic... right at the front entry of the school!